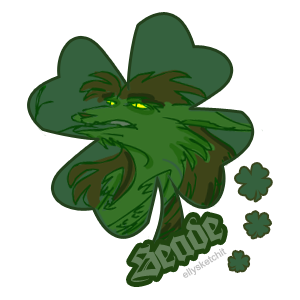 "Seade" is a name of Irish origin: perhaps from an Old Celtic word meaning 'high' or 'noble'. There's a small pun here on "seed" being that the alphyns are named after apple varieties! Despite their fun names, Wine and Willie are very stern, noble creatures that guard the top entrance to the Keep. They do this by turning their backs on each other and tensing, preparing for a brutal kick from their hooves. If the person manages to claw their way back up the steps and insist, they face the other way and the intruder is treated to dual pairs of slashing, ripping claws. They are courteous - the kick is a warning -- but a person only gets the one.